Having a press kit seems like a great idea since it means you'll have all the important information about both yourself and your books in one place for anyone interested to browse through. Also, having a press kit makes it easy for the author when she/he needs to send information about the book to someone months--or years--after the launch. There's no wondering which directory the information is in, no panicked searches (or perhaps that's just me!). You know where all the information is and it's easy for anyone to access. In her article, Book Marketing: Creating Your Author Press Kit, Tolulope Popoola discusses how to put together your own press kit. I hate writing these! But it is one of the first things people want to know. What's your background, what kind of books do you write, how did you become a writer? Your author bio should be about 200 words, and it should have things that make you sound interesting and professional. You should include your name, your place of birth or where you currently live, what you do (or used to do) for a living, what you’ve written, perhaps your education (if it’s relevant), quirky hobbies, or interesting travel experiences. Basically, anything that will make you stand out. This would also be a good place to list any relevant awards, were any of your previous books best-sellers, and so on. How can folks get a hold of you? A website? Blog? Twitter? Facebook? Also, list your agent if you have one. Steven Lewis advises writers to pay less attention to what your book is about than to what it can do for your readers. Also, consider what market, what demographic, would be most interested in your book. Provide up to three chapters. As for what format you should offer them in, Tolulope made a PDF available for download, but I would suggest making your sample chapters available in as many formats as possible. If you're having trouble converting your book from one format to another, you could try Calibre. The program is free and it's awesome. Often if a person is writing about your book they'll want a picture, so it's a good idea to provide the cover image. I don't think you need to provide this in many different formats, a jpg should be enough. List wherever your book can be bought as well as other sites it is featured on, sites such as Goodreads. Provide excerpts from reviews along with a link to the full text on the web. This is one line that sums up the primary conflict in your novel. For instance, they used to write a one line description of a movie on the can a reel of film was stored in that described the movie. This is generally quite short, something under 200 words or so. For example, this is Nathan Bransford's brief book summary for Jacob Wonderbar. This can be as much as 5,000 words or so that summarizes what happens in each chapter of your book (in other words, a synopsis) or it can be a book summary like you did above, just a bit longer. If you're like me you started off with a longer description and had to whittle it down to the essentials so you already have it. Some sites (Smashwords for example) allow you to post both long and short descriptions so it's handy to have both, just in case. By the way, this article of Nathan Bransford's is, hands down, the most helpful article I've read on summarizing a novel: The One Sentence, One Paragraph, and Two Paragraph Pitch. Also, see his article on how to write a one sentence pitch. Tolulope included a link in her article to Michael Hyatt's press kit. What advice would you give a new author interested in assembling a press kit? 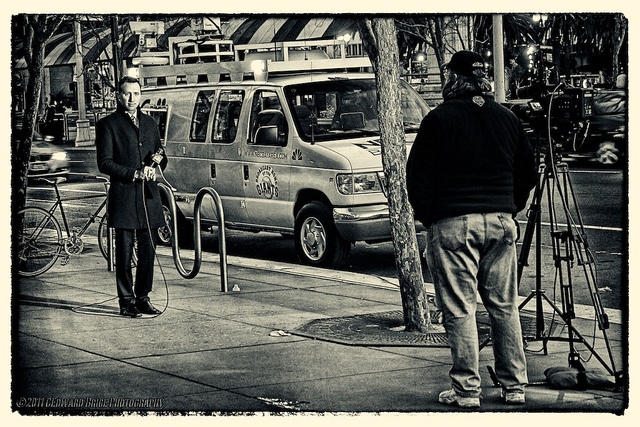 Photo credit: "The Reporter" by CEBImagery (dot) com under Creative Commons Attribution 2.0.